Claire Bradford, Assistant Manager of our travel agents in Colchester, recently jetted off to Bermuda for a look at the island’s best beaches, hotels and things to do. Here is how she ended up falling in love with this idyllic destination. (Hotel names/Ship name):Fairmont Southampton, Pompano Beach Club, Rosewood Tuckers Point, Coco Reef, Elbow Beach, Grotto Bay, Hamilton Princess & Beach Club, Rosedon, Cambridge Beaches & The Reefs. We flew from Gatwick North Terminal with British Airways. The check-in was very quick with minimal queue time and we were all upgraded to Club World, which was a lovely surprise and a real treat for our seven-hour flight to Bermuda. We boarded the aircraft, got to our seats and enjoyed a glass of Champagne. The seats were very comfortable thanks to the full flatbed seats that are offered when you fly World Club Class. We could recline our seats to watch a few films out of the many on offer and the food was of a very high standard with the snack kitchen available at any time. On the return, I was upgraded again but this time to World Traveller Plus. For me, it wasn’t particularly comfortable. I had an extra legroom seat with just a leg rest and no foot rest so I couldn’t reach the floor with my feet. By the end of the flight, my feet had swollen so much that I couldn’t get my shoes on because there was nothing to elevate my feet and legs. Having said that, I was pleased to have travelled in both classes as I can now explain to clients what each class is like with first-hand knowledge. We stayed at the Fairmont Southampton for all four nights that we spent in Bermuda. It is a very impressive drive up to the very large, very pink building that turned out to be the hotel. It has a vast wood panelled lobby with the lounge/bar leading off and stairs up and down to small parades of shops. We were allocated Deluxe Ocean View Rooms, which were very large and very nicely decorated. I would say that the bathrooms are slightly on the tired side but, having said that, everything was very clean. The view that I had was lovely and allowed me to look out across the swimming pool over the golf course to the ocean. I would definitely recommend upgrading to this room category. The breakfast buffet was incredible, with literally everything you could ever imagine eating and more on offer and all staff members were very friendly and helpful. There are a couple of very good restaurants close to the hotel (Henry VIII and Gulfstream) so you do have a good choice of dining options within the property or easily accessed by a short taxis ride. The two brothers that own the Pompano Beach Club are very enthusiastic about the hotel, which I believe goes a long way to gaining them a very high TripAdvisor score year in year out. All of the rooms are sea-facing and have complimentary Wi-Fi throughout. I wouldn’t recommend this hotel to guests with walking difficulties due to its hilly location and the number of steps leading to the beach and pools. Families would, however, find this a good option. There is a complimentary games room open to all ages, as well as tennis courts within the grounds and transfers to and from local golf courses and attractions. The beach is particularly good for families as it is one big sand bank. This makes the water very shallow even when you are a long way from the shore. The hotel offers two restaurants and is sold on a half-board basis. The Cedar Room has a different menu every day and the Ocean Grill has a set menu per season, giving the hotels guests a variation of food. This was my most favourite hotel. It is only seven years old and is still in very good condition with contemporary features that are still very elegant and luxurious. It is located in the most exclusive part of Bermuda and it shows. The staff here were very polite, attentive and also look great in their pink Bermuda shorts and navy jackets. It has its own water sports centre (non-motorised) and its own 18-hole golf course, which we had the pleasure of driving around on golf buggies. Then you can go past the golf course and down to the beach club, which was beautiful and is situated on the largest private beach in Bermuda. We walked into a very grand entrance lobby which was full of gold statues, large paintings and artwork of people with big eyes. You are being watched from every angle here! The hotel is decorated in the way that the Caribbean was in the 1980′s; very floral and garish colours. It is a very relaxed hotel with nothing especially luxurious about it, so if you are looking for a hotel with no airs and graces this is the property for you. All rooms here face towards the ocean and have either a balcony or terrace. I had high hopes for Elbow Beach as I had heard so many people say how nice it is. We walked into a very sparse reception building, there was a man playing a piano and I couldn’t quite work out if he worked there or if he was on holiday. We sat on a balcony overlooking the ocean and were served Rum Swizzles by a waiter who had been working at the hotel for 38 years. He was very sweet. The balcony was quite large and only had two tables and a few chairs. I feel that they could be making better use of this area in conjunction with the bar. We made our way from here down to the pool area which was fairly large and had sunbathing areas. I wouldn’t have thought that this gets used that much because the beach here is stunning; probably one of the best that we saw at any of the hotels with a really nice beach bar, terrace and restaurant. The rooms here were also some of my favourites. They have recently been refurbished and come as rooms, suites or cottages within the grounds of the hotel, so some of them can be quite private. The hotel is set on the side of a hill so I can imagine it being a bit difficult walking up and down on those hot sunny days. This is the only all-inclusive property in Bermuda and is situated 10 minutes from the airport. It is a casual hotel with three beaches and rooms that are located in low-rise buildings on a slight hill. We were lucky enough to spend the evening here. We saw a number of rooms which were nice but they are due to have a room refurb next year. Unfortunately, we couldn’t see the spa which is built into natural caves but I’ve heard it’s stunning and a must during a stay here. There are many facilities on offer including a water sports and dive centre, four tennis courts and a daily activities programme. We had dinner at the Grotto Bay; the food was of a very high standard and highlighted the fact that evening meals on the all-inclusive basis are all a la carte service – not a buffet in sight. 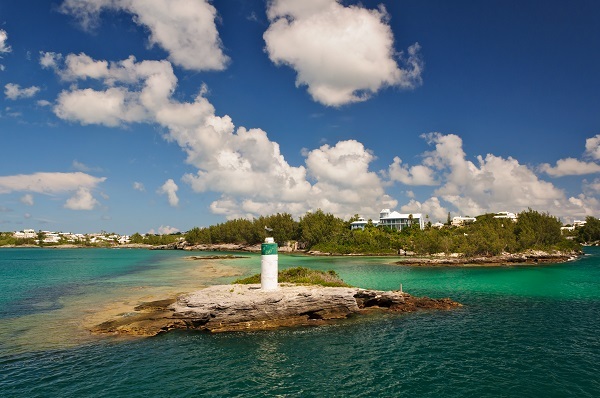 I would not hesitate to recommend this property for an all-inclusive holiday in Bermuda. This is a large city hotel situated right in the heart of Hamilton, Bermuda’s capital. The hotel has just finished a multi-million-pound refurbishment and has an infinity pool overlooking Hamilton Harbour. There is a beach club which is a short drive away for which the hotel offers a free shuttle service. The artwork around the hotel is amazing, so much so they have art tours available which, if I went back, I would do. They have got a lot of originals to view with a lot of funky pieces throughout the hotel’s public areas. There are a few restaurants to eat in and we had lunch in the hotel’s newest eatery, Marcus’ Bermuda. It is celebrity chef Marcus Samuelsson’s signature Restaurant and I would highly recommend the food here. The Rosedon is also located in the heart of Hamilton, directly opposite the Hamilton Princess. It is a very tiny colonial property which oozes style, tranquillity and elegance. The rooms are very pleasantly decorated and, apart from those that are in the main house, they are situated around the pool area. Although fairly small, the pool is very relaxing and at the back of the property so no road noise can be heard. The atmosphere is really a home from home. There is no restaurant here but a full breakfast is included, which can be served either in your room or on the terrace or by the pool. Afternoon tea is also included and guests are given taxi vouchers to a beach on the south shore. A light lunch and dinner menu are on offer, as well as the manager’s weekly Swizzle Party. Beau’s Bar and Clarabelle’s Pantry are operated on an honesty principle, so you can help yourself to drinks and snacks before writing your own bill. It was a very welcoming and comfortable hotel for a relaxing and informal stay. The Reefs Boutique Hotel overlooks its own beautiful private pink sandy beach. It is known for its traditional Bermudan hospitality, good service and attention to detail. From the front, you can’t see much apart from an entrance straight off of the road. However, on entering, you are greeted with friendly staff and a nice reception area leading into the restaurant and bar. There are numerous restaurants at The Reefs and we had lunch in one of these. ‘Coconuts on the Beach’ is, as the name suggests, located on the beach and is open daily. The food here was very good, there’s an amazing view over the beautiful turquoise waters and pink sandy beach, and the staff are very attentive. There are a few room categories to choose from, but whichever room you decide to have you can always see the ocean. Facilities available at The Reefs include a spa, snorkelling and kayak equipment, a gym, two tennis courts and a golf course. There is free Wi-Fi throughout the hotel and complimentary afternoon tea is available each day. Our first excursion was a scenic drive from the Fairmont Southampton to Horseshoe Bay, which is one of the most beautiful white sand and turquoise water beaches I have ever seen. 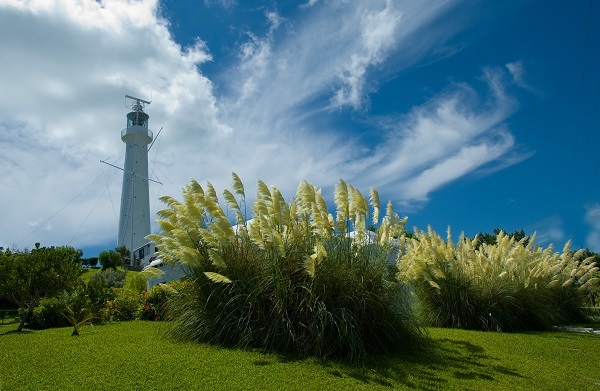 We then carried onto Gibbs Lighthouse before making our way past Somerset Bridge (The smallest working drawbridge in the world).The lighthouse is up on one of the highest points in Bermuda and therefore gives amazing views across most of the Island. On our second day, we went to St Georges, a beautiful little town with fantastic architecture from many years ago. It was very pretty and well worth a visit. A good time of the day to go is at midday when the town crier conducts a re-enactment of an 18th-century trial. This entertaining and light-hearted re-enactment shows how an offender was publicly punished and includes the ducking of a nagging wench over the harbour edge. We had a couple of hours to wander round Hamilton – another pretty place located on the water’s edge. The buildings across Bermuda are all painted in pastel colours, which makes the towns and villages very clean looking. We took the road train for a city tour which was a good way to see the city’s places of interest such as City Hall, Perot’s Post Office and the Botanical Gardens. From Hamilton, we took a ferry across Great Sound to Waterford Bridge. It was nice to get out on the ferry to see Bermuda from the water. On our last day, we visited the Royal Navy Dockyard, built in the early 19th century and once Britain’s largest dockyard outside of the UK. Now it has many shops, bars, restaurants and crafts including Rum Cake making and Glass Blowing. In 2017, it will be home to the 37th Americas Cup. I honestly, hand on heart, loved everything about the trip and everything about Bermuda! A highlight for me was seeing the men dress in suits on the top half of their bodies and Bermuda shorts on the bottom. You really do have to see it to believe it. It’s not just a plain pair of shorts with a shirt, tie and jacket; it is normally a very loud pair of shorts with long socks and shoes. With Prestige as hosts, I don’t think you could improve on such a fantastic trip. 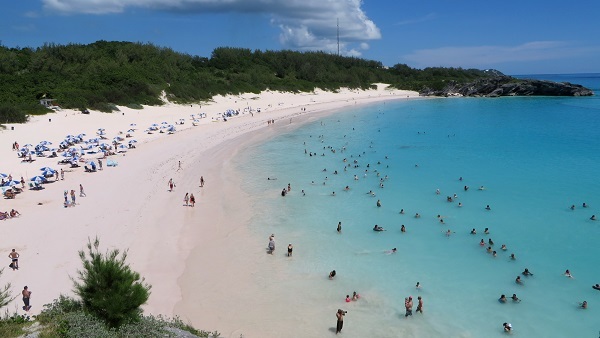 I would definitely recommend Bermuda to everyone if you are looking for a luxury beach holiday. It does come at a price, though. The island is very safe and friendly, has the most amazing beaches, has a hotel to suit everyone’s needs and is only a seven-hour direct flight from London Gatwick. I would like to thank Paul Hardwick & Prestige Holidays for giving me the opportunity to visit Bermuda. I think it’s an amazing place and has been on my bucket list for quite some time and now it is well and truly ticked. One piece of information worth remembering is that there is no car hire available in Bermuda. You can hire mopeds or use the public transport very cheaply, but homes are limited to one car per house. The roads are very small and windy and by limiting the number of vehicles it helps with pollution, traffic flow problems and accidents. If you would like to book a luxurious beach holiday like the one that Claire enjoyed, we can talk you through all of the options. Call in at one of our many travel agents in Norfolk, Suffolk, Essex or along the south coast.